Kitchen to service small receptions. Facilities for 100 seated theatre style. 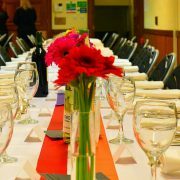 Facilities for 50 guests for business / conference lunches. Disabled access (lift from ground floor).